Organized at Philadelphia and mustered in April 20, 1861. Moved to Chambersburg May 28. Attached to Geo. H. Thomas' Brigade, 1st Division, Patterson's Army. March to Greencastle June 6. Cross Potomac and advance on Martinsburg Road June 15. At Williamsport June 16-24. At Downsville until July 1. Falling Waters July 2. Occupation of Martinsburg July 3. Advance on Bunker Hill July 15. Moved to Charlestown July 17; thence to Harper's Ferry. Mustered out August 9, 1861. The Twenty-first regiment originated in a rifle battalion attached to the 1st Brigade, 1st Division of the State militia commanded by Major John F. Ballier. It consisted of the Lafayette, Washington, Sarsfield, and Philadelphia rifle companies, of the city of Philadelphia, and the Jackson rifle company of Manayunk. The services of the Battalion were tendered to the President on the 15th of April, 1861, and were accepted, on condition that a full regiment should be ready for muster within ten days. Drill, by company and squad, was commenced immediately on the receipt of orders to recruit, and was continued day and evening while the force remained in the city. The vigor displayed on every hand in organizing troops, produced the conviction that an early forward movement was to take place, and the men of the Twenty-first confidently expected, when they enlisted, to be at once led into active service. On the 21st of May, it was ordered to Suffolk Park, where regular instruction and camp and guard duty were continued during its stay. Drill was frequently practiced under the eye of Major General Patterson, the commander of the Department, which elicited his hearty commendation. Voluntary contributions of food and clothing by the people of Philadelphia, and especially by the Germans, were freely supplied, and before leaving Suffolk Park the men were generally provided with an outfit of minor articles necessary for their convenience and comfort while in active service. On the 28th of May, the regiment struck tents, and, marching to Philadelphia, proceeded to Chambersburg where it was assigned to the 1st Brigade,* lst Division of Patterson's army. Moving to the Potomac, it was frequently engaged in skinmishing along the river, the enemy holding the opposite bank. 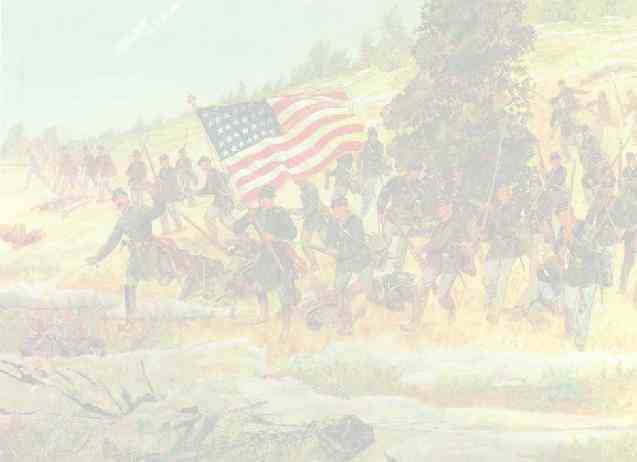 On the 17th of June, the Brigade crossed into Virginia, but soon after returned to the Maryland side. The rebels, who had retreated as our army advanced, now returned in large numbers. A body of three hundred of their cavalry re-visited Harper's Ferry to complete the destruction which they had previously begun, and the whole country along the Virginia shore was again infested with their troops. Union men were seized and hurried away within their lines, and the destruction of property which ensued, marked the beginning of the misfortunes which for four long years were visited upon the inhabitants of the Shenandoah valley. Remaining encamped on the Maryland side, engaged in drill and guard duty until the 2d of July, the regiment moved with the Brigade to Martinsburg, participating in the skirmishing which ensued on the way. Encamping near the town it remained nearly two weeks, and while here was presented with a stand of colors by the Union Germans of Martinsburg. After participating in the demonstrations made upon Bunker Hill and the approaches leading to Winchester, it marched to Charlestown, where it remained several days in camp, and from thence was ordered to Harper's Ferry. The regiment was solicited by the commanding General to remain beyond the period of its enlistment, and a general willingness was expressed to comply with this request; but its services not being needed, an order was issued for its discharge. Obtaining rail transportation it moved via Baltimore to Philadelphia, where, on the 8th of August, it was mustered out of service. The Twenty-first had no opportunity to show its fighting qualities, but it was well disciplined, and for its soldierly bearing frequently received complimentary notices from its commanders.